This post is the first edition of a 20 posts collection with clear data to explain the relationship of Solar PV and Wind Energy world markets with the mining industry. We will check the production of metals, industrial and construction minerals to build solar modules and windmills around the world. Any processes that involve the extraction of raw materials from the earth to be used by consumers. The extractive industry consists of any operations that remove metals, mineral, and aggregates from the earth. Examples of extractive processes include oil and gas extraction, mining, dredging, and quarrying. Due to the process of electrification linked to the development of low carbon society, power will balance with fuels in future energy structure. Meanwhile, the intensity of energy (electricity by production unit; MWh / tonne) is increasing year by year due to mining aging, lowering ore grade, the longer distances between pit and process plants to the ore and the increasing rock hardness due to deeper mines evolution. All of these facts imply an increasing power consumption share of extractive industries over the global market production of energy, including renewables. For this reason, the share of mining in solar electricity will increase in future. We try to show this evolution in the following figure. In 2015 world extractive industries required 38 TWh of Solar PV electricity. Qatar consumed 34 TWh by 2014. In our next article, we will analyze the requirements of Mining to Wind Energy World Market. Can you please explain your sentence “In 2015 world extractive industries required 5.6 GWp Solar PV installations”? Is it your own calculation, and if yes how did you get to these numbers? Based on the assumption we are in a global market with a world energy consumption, extractive industries (defined as International Energy Agency) required 10% of primary energy by 2010 (IEA same source). The ratio of increased energy needs in mining is between 2 and three times the ratio of global increased of energy consumption. This trend means that mining will increase the share of energy (power and fuels) in the total primary consumption. Therefore nowadays the share of use of energy is about 11.3% and by 2015 an 11%. 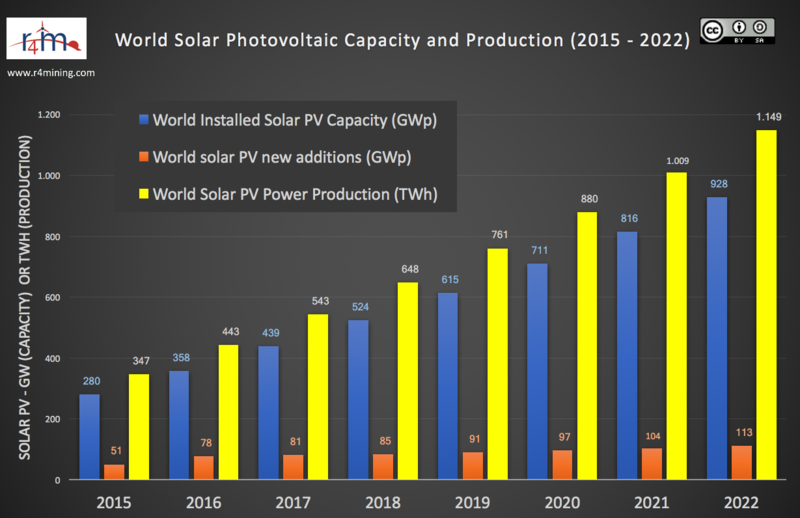 If we applied this share to the global Solar PV market in 2015, the result is 5.6 GWp and 38.1 TWh/yr. These data are made based on several updated studies published until November 2017. If you or your company need more details about our study (made by REMIO, Renewable Energy & Mining International Observatory), I recommend you wait some days meanwhile I publish new posts on this subject.